Even before I had a baby, I totally looked forward to the weaning and introduction of solids to my kids. I remembered some of the fun things we had done when my little sister started eating solids and how in particular we’d mash up potatoes for her. With new generation Instagram mums and social media it also seemed uber cool. Lots of ideas, recipes, tools and information surrounding weaning. Cookbooks too - with modified Nigerian recipes (our kids got to love Nigerian food yes!). So yes, I was determined to be that “extra” and diligent mum who made colourful purees and fed her child nicely in the cutest baby high chair. And when our son arrived, I didn’t see why not. He didn’t seem fussy at all. He latched pretty much immediately and started sucking. When I introduced bottle feeding he didn’t particular care if he was being fed from the breast or a bottle. He also took very well to formula, which I introduced due to a not-so-great supply of breast milk. I recall when the health visitor came around by his 6 week check up she mentioned that it was recommended to give children Vitamin D drops from birth to 4 years to help their bones grow and develop properly (especially as we were into winter season already, and there was barely any sunshine). But when I explained that he was having up to 500ml a day she said it wasn’t necessary as formula is fortified with vitamin D. But if you’re exclusively breastfeeding it’s recommended as you can’t tell if your diet contains sufficient vitamin D. Anyway I had this info at the back of my mind as I approached weaning and had my eyes on the Wellbaby vitamin D drops. I’d used the Pregnacare multivitamins all through my pregnancy so it was going to be a smooth transition on the same brand. This is just based on my own observation. The way he enjoyed his milk and guzzled this up was the same way I thought introduction to solids would be a breeze. I guess not, and the very many funny faces he pulls on first taste of a food item is evidence of that. I guess that’s general logic though. For example I’m such a foodie myself, doesn’t mean I’m open to easily trying new tastes and texture. I first learnt of this distinction via Instagram thanks to Temi who we featured in this post. These are the two major approaches to weaning, and while more babies tend to simply favour spoon led weaning - where they are fed from a plate and spoon, others are pretty keen on exercising their independence that they only want to eat themselves. Well, hello baby-led weaning then! And this was where my independent son chose to camp. I’ve never seen any baby firmly dislike being fed with a spoon. Trust me, we’ve tried all the tricks including the ever popular letting them hold a spoon to play with while you try to get the other spoon into their mouth. So he’d eat up a whole slice of apple, toast, rice cakes (or anything else with a firm texture that he can hold) in a second, but do not attempt to give him a spoon of mashed purees. So, speaking of purees, you know how excited I was to try - my little baby food blender, storage bowls, and fresh fruits! All of the books and yummy Instagram mummies make it look so easy and technically it should be. But perhaps because my child din’t relish it up - it began to feel like a chore. I kept wasting most of it and occasionally tried out the store bought ones (still with no luck!). But for the days I made my it all fresh, I gave myself an extra pat of the back. And you should too! If you’re going to let your baby explore a wide range of foods and textures, then people, be prepared for messy. There’s probably no cute way to experience weaning! And trust me, I tried. I tried to have him eat on his high chair and close to the dining table like everyone else. But seeing how many little stains I had to get off the light coloured carpet and how cautious I was becoming, no one told me to move to the high chair to the tiled floor area! So yeah, be prepared. And while you’re at that, arm yourself with a lot of wipe clean bibs. Using cloth bibs for a weaning baby will either lead to a spike in your electricity bill or a tired wrist from hand-washing them! Do not doubt. You are an excellent singer and composer. Or at least it’s in there somewhere and all you have to do is spend a few days with a weaning baby to see that come through. I’m amazed at all one has to do just to get a baby to eat a few tiny spoons of food. The songs you sing - who cares that it’s offtune or that you almost bite your lip in the process. I recall once my husband was trying to feed him some purées and sing about the animal sounds and he goes “the rabbit goes “rab rab rab”. I howled in laughter like what?! Throw in the funny faces you have to make and honestly you might as well make it a full time career. After all said and done, and at the very end of the day, what is absolutely crucial is a healthy well-fed baby. It’s so easy to get caught up in a comparison game with babies. And wondering why you’re child isn’t eating a full bowl of fancy porridge and toppings or enjoying amala and okro that Nigerian mothers swear by. All children are different. But don’t let the crazy weaning process put you off. Continue to introduce them to a wide range of food for a varied palette, including vegetables too! 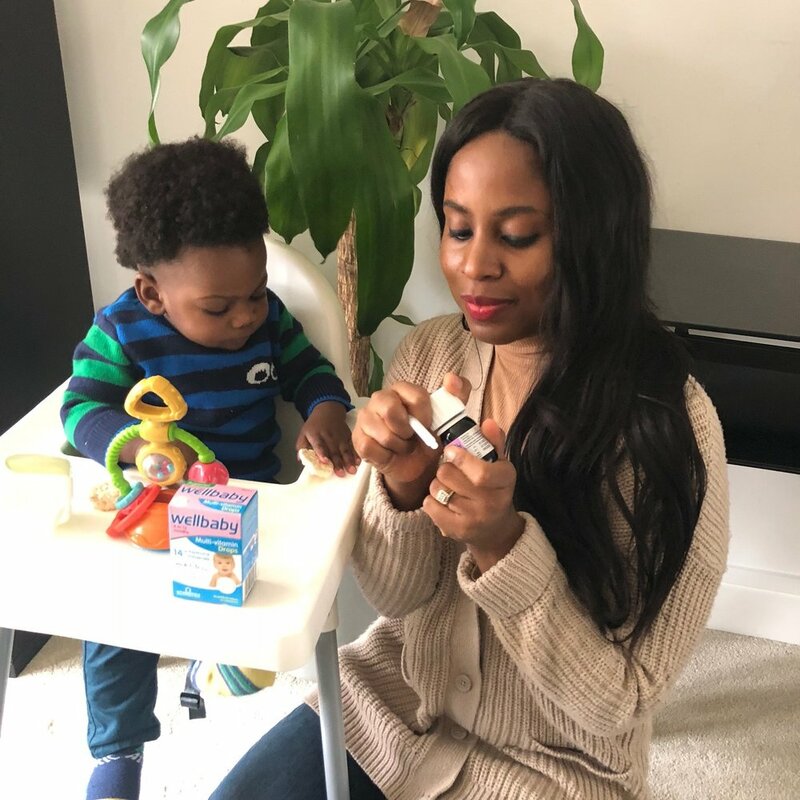 And especially at this weaning age when it’s tricky how much nutrients your little one is getting, topping up their diet with essential multivitamins is so key. Also when you live in colder regions or don’t get much exposure to sunlight, Vitamin D is super important! I still use the spoon trick to get any medicines into his mouth, as you can see from these photos - and attempt to give him the Wellbaby multivitamin drops. This particular pack is for 4 months - 12 months babies and I love that it comes with a helpful syringe which makes the process a little less messy. In other news, I can’t believe we’re already at 11 months and almost one year! We kinda just had him (birth story here). I hear the next crazy thing is potty training and I’ll tell you for free that we are not looking forward to that stage. How did weaning go for you? Share your experiences please. And did you supplement your little one’s diet with multivitamins? pS: This post is sponsored by Vitabiotics, and they’re keen to highlight the importance of vitamin D for growing babies. PpS: Can I shout out to my mother-in-law for these photos?